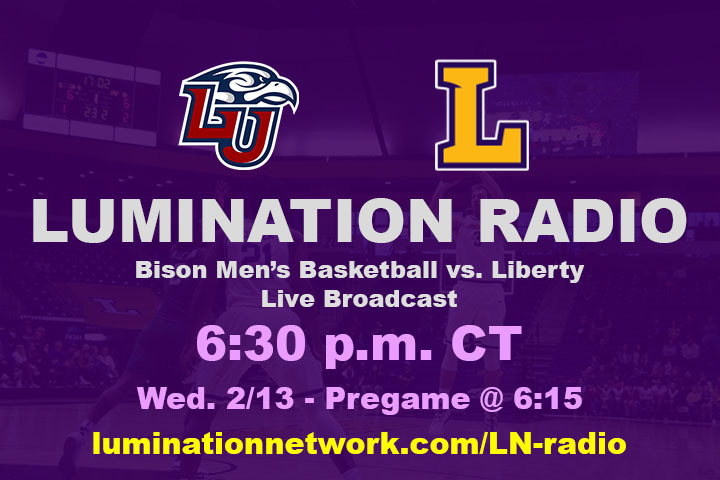 Lumination Radio is slated to run a live broadcast of Wednesday night’s game against Liberty University at 6:30 p.m. CT. Spencer Boehme will be on play-by-play, and Russell Vannozzi will be on color. The stream is free to listen to, and you can access it here. Pregame is at 6:15 p.m. CT. The Bisons are 20-4, undefeated in the ASUN and ranked 30th in the NCAA NET rankings. Liberty (21-5, 10-1 ASUN) stands at 61st. The Bisons beat Liberty 79-59 last time the two teams met. Senior guard Garrison Mathews averages 19.8 points per game for the Bisons. Redshirt junior forward Scottie James averages just over 12 points per game. For more information, follow Lumination Network on Twitter @luminatinnet and Lumination Radio @LuminationRadio.